Synopsis: Jean Holton is invited to Penberthy Island by Seth Bassett, but unknown to her, he dies while she is en route; and she arrives while his funeral is occurring. While Jean waits for them to return home, she goes behind the barn and discovers the body of Marilla Bassett, Seth's spinster sister. While Jean is trying to settle in, Seth's widow Fannie misunderstands Jean's position, assuming Jean has come as hired help. Jean manages to cope with that position; as Fannie considers her house guests as either paying "boarders", or "hired help" who exchange work for room and board. While the dust is settling from the two deaths, Jean finds someone is trying to poison her. She strikes up an alliance with Mahlon Hobart, who moves in as well in order to protect her. Someone is sneaking around the house trying to find something, and put people out of the way as well. Selectman Elisha Macomber tries - unsuccessfully - to prevent another murder from occurring. Jean discovers a friend masquerading as an enemy, and an enemy masquerading as a friend. Review: The Bassetts are a complex family, and I had to stop and sketch out the relationships early on, as summarized above. The body count rises and the action keeps escalating, a definite page-turner. The final scene in which Jean comes face to face with the murderer is reminiscent of a Hardy Boys adventure, with many of the usual clichés thrown in: a hidden treasure map, a buried treasure, and the obligatory abandoned mill with the water wheel of the title. 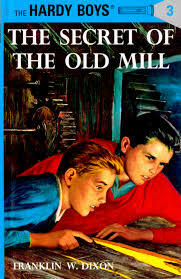 Think of it as "The Secret of the Old Mill" for grown-ups. 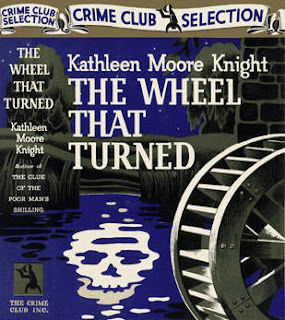 Another satisfying Elisha Macomber mystery, made even more believable since he is unsuccessful in preventing one of the murders.